Big Red Book’s Payroll software gives you total control over your payroll saving you time and money. First time using Payroll Software? As you grow we’ll be right there with you. 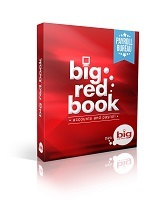 We don’t put any limits on the number of transactions you can enter in Big Red Book. Purchase extra user licenses so that everyone who needs access to your accounts can have it hassle-free. Find the right reports for your business and get the information required to make better business decisions. Raise and send invoices quickly and easily to your clients. Cash based businesses can enter VAT as part of your sales transactions and VAT will be included in your reports. © 2019 Big Red Book.